In FY2011 iPod revenue was $7.453 billion. In FY2012 iPod revenue fell to $5.615 billion and in FY2013 iPod sales revenue came in at a lowly $4.411 billion. This fiscal year, iPod revenue may come in at or below $2 billion. In the first half of FY2014, iPod unit sales revenue declined by more than 50% on a year-over-year basis. The demise of the iPod product line materially reduced Apple’s aggregate revenue growth rates over the past three fiscal years and will again reduce Apple’s reported revenue in the fiscal year ending in September by more than $2 billion. Although Apple has recently reduced prices on the iPod touch and added conspicuously missing features to the entry-level model, this will not forestall the product line’s fade into oblivion. This fiscal year, the decline in iPod unit sales will reduce total reported revenue by about $2.25 billion. Moving forward, the iPod line will be essentially immaterial to the company’s results in FY2015 as Apple's reported revenue will move above $200 billion. The iPod line will represent less than one percent of Apple’s reported revenue total in the coming fiscal year. The net impact of the iPod line’s demise is that next fiscal year Apple’s reported revenue growth rates will reflect more the underlying growth rates of the company’s three major device lines. Any new products or services released this fall will be wholly accretive to revenue. Wall Street analysts are currently forecasting revenue growth in the June quarter of about 7.0% to $37.80 billion and revenue of $40.57 billion in the September quarter representing expected revenue growth of 8.30%. For the fiscal year, the revenue consensus is $181.61 billion or a year-over-year revenue rise of about 6.30%. These consensus estimates reveal Wall Street expectations for revenue growth to accelerate in the second half of the fiscal year. The addition of China Mobile and NTT DoCoMo as authorized iPhone carriers no doubt influence the market’s revenue growth expectations for Apple. This fall China Mobile will participate in the initial launch of new iPhone handsets for the first time. Adding to the revenue benefit from the addition of the two carriers, Apple’s management has stated the change in handset upgrade policies of the domestic carriers has skewed the iPhone upgrade cycle and has extended the cycle into the June quarter. By most accounts the iPhone 5 series handsets have continued to hold their own in the market and analysts are expecting a comparatively strong June quarter unit sales performance from Apple’s most popular product line. There’s no disputing the iPad’s global leadership in the tablet market. The big question to be answered is the global appetite for tablet products. The iPad’s undisputed success following its initial release in 2010 was due in large part to the content already available for iOS-based devices as developers and content providers raced to meet demand from iPhone owners. 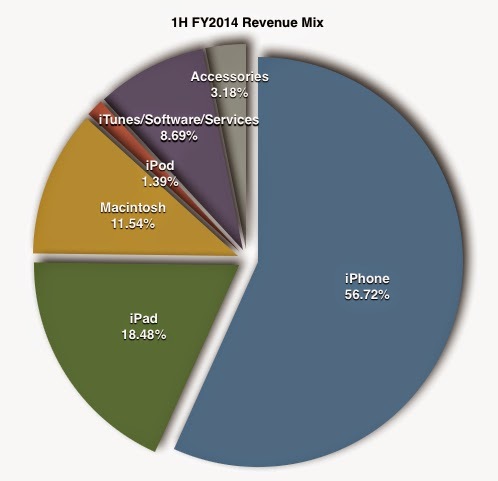 In FY2013, iPad unit sales rose about 22% to 71.033 million units. In the first six months of the current fiscal year iPad unit sales rose by only 48,000 units to 42.385 million units. The introduction of the iPad mini in the fall of 2012 was the primary catalyst for the rise in unit sales last fiscal year. I expect iPad unit sales this fiscal year to reach 75 million. In the recent March quarter, Apple’s management chose to make major channel supply adjustments to the iPad line versus adjustments to the iPad line in the June quarter last fiscal year. Last year’s June quarter adjustments led to a decline in reported unit sales in the period of 14.23%. In the March quarter this year, the iPad unit sales decline following channel supply adjustments was 16.05%. For the fiscal year, I expect iPad unit sales to rise about 5% with virtually all of the unit sales gains in the latter half of the period. Although the global PC market is in a state of inextricable economic decline, Macintosh unit sales continue to rise. Apple recently released a lower-cost iMac to provide a competitive product in the $1,000 range. Although the new iMac’s components offer lower performance for the $200 savings, Apple is broadening the product line to appeal to more customers. I expect modest single-digit unit sales growth, on average, over the next few quarters. For the fiscal year, I expect Macintosh unit sales to rise by close to one million units to greater than 17 million units sold. While much has been written about Apple’s decision to increase the amount deferred on each Mac and iOS-based device sold, the impact of this change in revenue recognition policies on reported revenue will now begin to diminish. As of March 29, 2014, Apple’s deferred revenue balances totaled $11.474 billion. Of that amount, $8.31 billion will be recognized this fiscal year. In the March quarter the combined deferred revenue balances (current and non-current) changed by only $46 million on a sequential basis and by $1.332 billion on a year-over-year basis. Although the deferred revenue balances will remain high, the increase in the total deferred revenue balances on a quarterly basis will begin to diminish dramatically with the start of the new fiscal year and after the first four fiscal quarters the new deferred revenue schedule has been in place. In the first six months of the current fiscal year, the combined deferred revenue balances increased by $1.414 billion. Speculation about an Apple iWatch or series of watches from Apple is now rampant with highly respected Wall Street analysts such as Morgan Stanley’s Katy Huberty offering early analysis on how many units Apple might sell in the first year of release. The Apple iWatch, when released in the fall, will be wholly accretive to revenue. Along with mounting evidence of the pending introduction of larger-display iPhones, these yet-to-be-announced products will add to Apple’s FY2015 revenue growth performance and push the year’s reported revenue total well beyond $200 billion. The continuing decline in iPod revenue has masked the rates of revenue growth of Apple’s three major product lines by diminishing the company’s aggregate revenue growth rates. Combined with changes in the company’s deferred revenue policies which also diminished reported revenue in the first half of the fiscal year, the early adjustments to iPad channel supply in the March quarter and the changes to domestic carrier upgrade policies instituted this year, Apple is poised to report much higher revenue growth rates in the latter half of the fiscal year than the company reported in the first half of the period. Apple will deliver total reported revenue in FY2014 above the current Street consensus of $181.61 billion and handily surpass the Street’s current consensus estimate of $194.19 billion in FY2015 revenue even without the introduction of new products and services. Combined, the iPhone, iPad and Mac lines along with the double-digit revenue growth rate delivered by the iTunes/Software/Services segment puts Apple on track to reach revenue of $200 billion in FY2015. This estimate is inclusive of the expectation for larger-screen iPhones to debut this fall. Add to the FY2015 revenue mix the much-anticipated release of the iWatch line of accessories and Apple may deliver reported revenue growth of greater than 15% next fiscal year or total reported revenue approaching $210 billion.